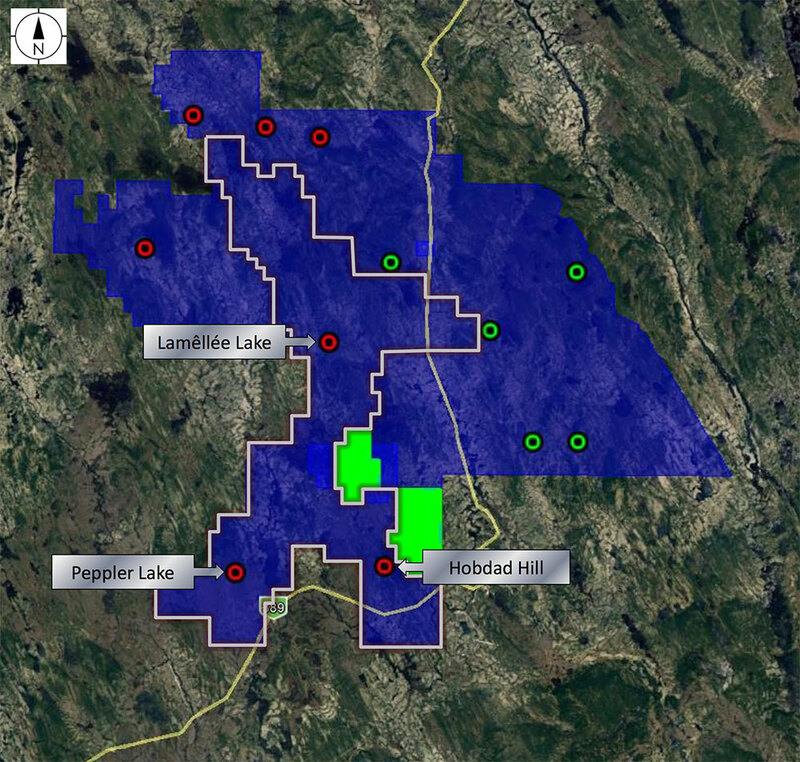 Located directly to the west of the CFLN project and the Lamelee South deposit, the group of properties known as the Quinto Claims was acquired by Champion Iron as part of the Bloom Lake Mine purchase. The Quinto Claims encompass the Peppler Lake, Lamelee Lake, Hobdad Hill, Jean Lake and Faber deposits. Mineral resources for the Peppler Lake deposit were originally estimated at 274 million tonnes at 28.5% Fe in 1979. The resources were calculated from 22 drill holes completed in 1955. Following the drilling of 18 holes in 2007, an NI 43-101 technical report brought the resource estimate up to 293 Mt at 28.46% Fe. Since then, little work has been done on the deposit. In 2014, a 249-meter drill hole intercepted 49 meters of iron formation at 32.62% Fe. The Hobdad Hill deposit has been known since the 1950s, but the first drillings were completed in 2006. Between 2006 and 2014, 19 drill tests were completed for a total of 6,780 metres. The Jean Lake and Faber indices, like the other deposits in the sector, were discovered in the 1950s. The Jean Lake index was drilled once in 1955 and four times in 2004, whereas Faber was drilled ten times in 1961 and four times in 2004. The grades are similar to other deposits in the region, at 29-30% Fe. Also discovered in the 1950s, the Lamelee Lake deposit was not evaluated before 2009. The estimated resources based on 76 holes drilled in 2007-2008 suggest the presence of 642 Mt of indicated resources at 30.28% Fe and 70 Mt of inferred resources at 28.63% Fe. The Quinto Claims cover several indices, which combined could contain a large iron ore volume with hematite and magnetite grading at approximately 30% Fe. At this time, Champion Iron’s mandate is to clearly define the potential of the resources in this sector.